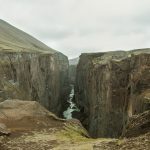 Discover the tiny town of Breiðdalsvík with a population of 139, colorful Reyðarfjörður Fjord, an old turf-roof farmstead bursting with summer wildflowers, and the remains of an abandoned fishing village. Crossing rugged mountain roads and rushing rivers in our sturdy 4×4 vehicle, we take our time to enjoy rugged seascapes and the unmatched natural scenery found in this sleepy corner of the world. Along the way, we stretch our legs on Meleyri black sand beach, hike along a hidden waterfall, and hopefully spot reindeer running in the wilderness during winter. 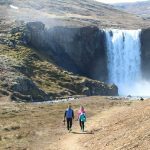 Nature and Culture offers you the ultimate opportunity to experience the essence of Iceland’s Eastfjords during all four seasons and is not to be missed. 2 adults or minimum rate. At the harbour in Seyðisfjörður. 7 am, 8 am, 9 am, 10 am and 11 am Duration: 6 – 7 hours. If you want a private tour please contact us for more information. If you need a pick up at another place please advice when you reserve the tour. Please note that additional cost may apply. If you are more than 12 adults please contact us for tour bookings. Child prices apply for children 12 years and younger. Due to weather and/or road conditions we might have to alter the itinerary, have longer journey time or cancellation of the tour. If you want to buy a lunch pack please advise when you book the tour. Additional cost will apply.